Peterborough Milton Juniors represented Northamptonshire at the English Junior Champion Club Tournament on Aug 25-26 at Woodhall Spa. 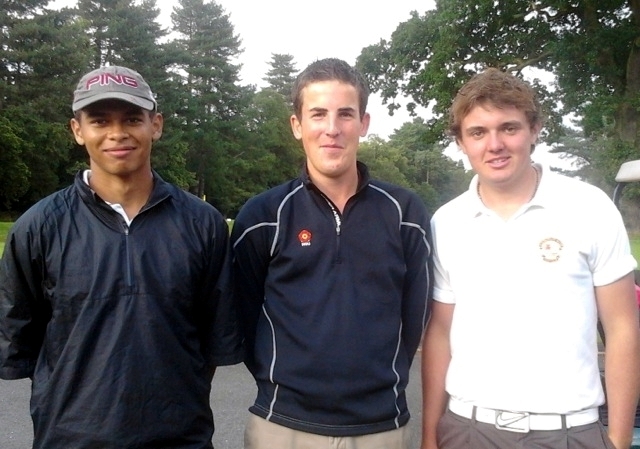 Ryan Rowe, James Clark, and James Walters - pictured after their 5th place missed out on first place by only 2 points despite James Clark's first ever hole in one at the 16th. Out of the 31 clubs representing Counties across England, Milton Juniors (representing Northants) came 5th at this event following a really exciting finish at Woodhall after 2 days and 36 holes of golf on the Bracken course. Overnight clear leaders Suffolk (Fynn Valley) had a not so good day and were caught by Shropshire & Hereford (Bridgnorth) with a total of 155 - winning on countback. Milton were in 9th place overnight but a solid second round jumped them into 5th place only 2 points adrift of the winners on 153 with Gloucestershire (Forest Hills), and Nottinghamshire (Trent Lock GC) on 154, 3rd and 4th respectively.